Find all kinds of great gifts for the holidays, like Peanuts merchandise, at Retro Active! We will be open on Thanksgiving Day 11am-4pm. 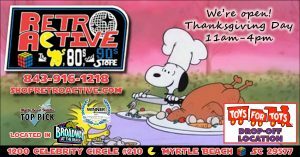 Retro Active, for the 5th year in a row, is a TOYS FOR TOTS drop off location. Let’s help make Christmas special for every child! We will be accepting toys through December 16th.